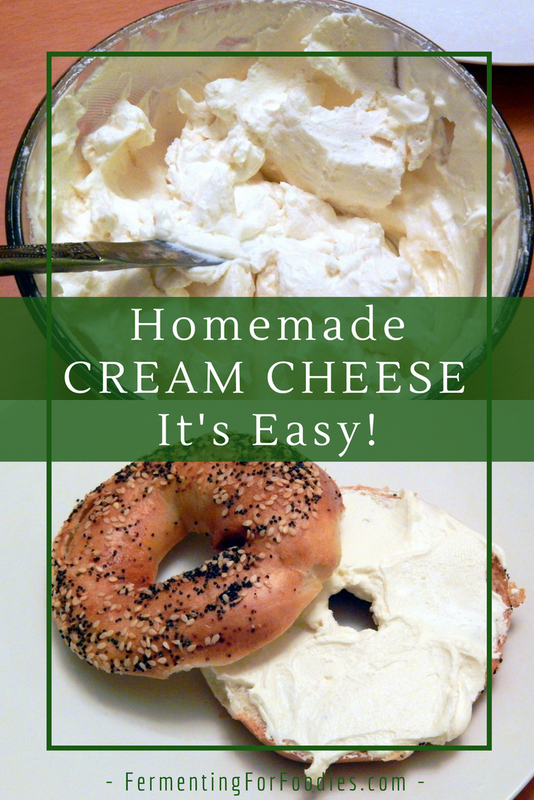 There are so many different ways to make cream cheese. You could curd milk with anything from yogurt to lemon juice. However, to get a thick cream cheese, you need to use rennet. 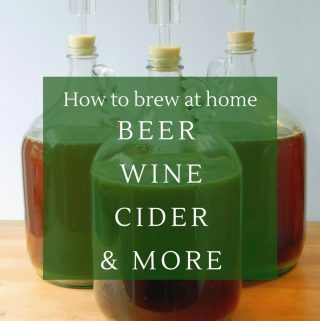 I also recommend culturing your milk before curding to add flavour. 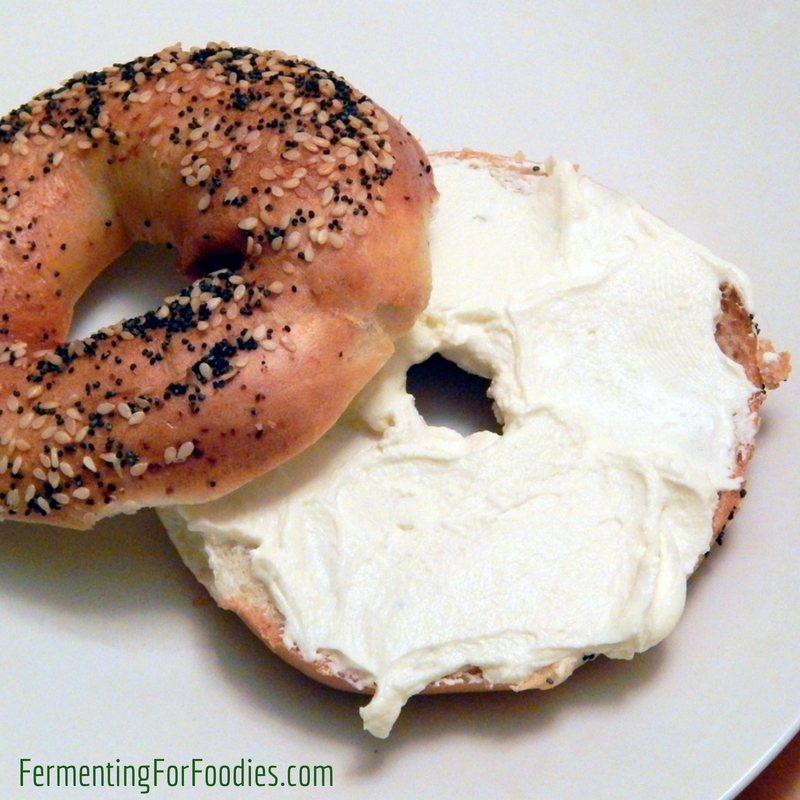 The best thing about homemade cream cheese is that it is very affordable, spreadable and delicious! Heat milk and cream up to 72 F.
Gently whisk in calcium chloride for 1 minute. Then gently mix in the rennet, being sure to use an up and down motion so that it is fully mixed in. Leave for 12 hours at 72 F (put it near your hot water heater or on your fridge). The milk should have firmly curded. Pour the curds into a strainer lined with several layers of cheese cloth. Tie the corners together and allow to hang for 6-8 hours. Remove curds from the cheese cloth and place in a bowl with the salt. Stir to combine. Store in a container in the fridge for up to 2 weeks. -Since this is a fresh cheese, sterilization is not as necessary. But it’s always important to keep everything clean! 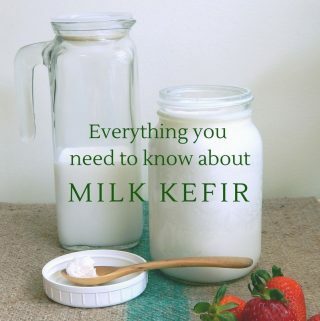 -Use buttermilk or kefir to culture your milk for a delicious and probiotic cheese. 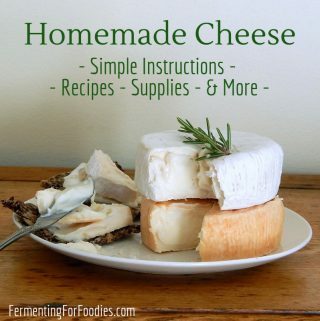 -If you have never made cheese before, I recommend reading this overview post on making cheese for a detailed explanation of each of the steps. and press for 12 hours for a cream cheese brick. 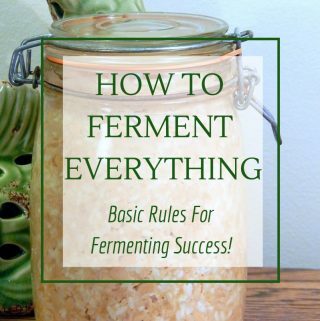 To learn more read this post on finishing cheeses. Cinnamon Honey: Mix 2 tsp cinnamon, dash of nutmeg, 1/2 tsp vanilla and 1/2 cup of honey into the cream cheese. Perfect for dipping apples or spreading on carrot cake! Roasted Garlic and Red Pepper: Roast 2 red peppers and 4 cloves of garlic. Peel and deseed the red pepper. Grind the red pepper and garlic into the cream cheese using a food processor. Herb: Finely dice 1/2 cup of fresh basil, 1/2 cup of chives and 2 tbsp of fresh parsley. Mix into the cream cheese.